Popular pump with aquarists, the Hydor Koralia Evolution series boasts up to 20% more water flow than Koralia 2, 3 and 4 Controllable with greater energy efficiency. Affordable and reliable pump – great for creating water movement in all areas of your tank. Suction cup and magnet mounting system measures 2.75" diameter. Suitable for aquarium glass up to 1/2" thick. 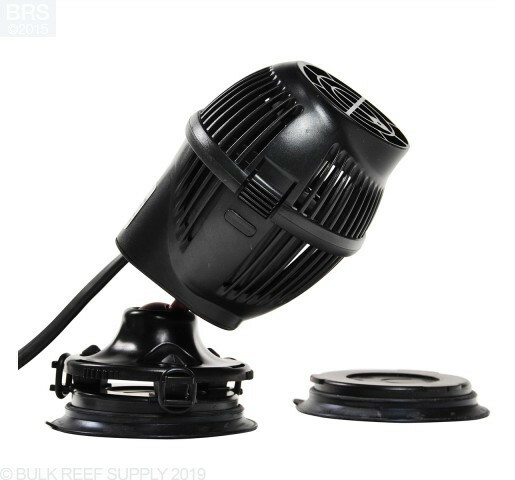 Hydor Koralia Evolution submersible powerheads are a popular choice becauxe they are affordable and reliable high flow powerheads. Higher efficiency Hydor Koralia Evolution pumps generate up to 20% more water flow than Koralia 2-3-4 at HALF the energy consumption. Upgraded, shaft-less impeller boasts unique design for wide and gentle water flow beneficial to aquarium inhabitants. Patented magnetic base with articulating ball joint allows full, 360-degree range of convenient pump positions. Direct vital water movement to areas of your aquarium never possible with conventional powerheads. I bought 2 of these pumps. I purchased one 3 years ago and another one, 1 year ago. One of them (I don't know which one it was since they look the same) recently stopped working. I looked at it and noticed a big crack in the housing. I don't use a waver maker with it and never dropped it. I'm not sure if I'll buy another one. I was always happy with it until it stopped working. I bought 2 of these 3 years ago for my 150 gal FOWLR. They worked well for 2 1/2 years until they began having startup issues. I didn't think anything of it except that they needed maintenance. It wasn't until I installed a grounding rod that I found a problem. My GFI kept tripping and I narrowed it down to a Hydor circulator. I unplugged it and removed it and I found 2 large cracks in the housing. These were obviously allowing water into the electrical pump and causing a current leak. A few days later I removed the other Hydor and found cracks in the same place! I have suddenly lost 2 dwarf lion fish in the past 6 months who were very healthy the day before, and I can't help but think that this may have been a contributing factor. I now have some Tunze pumps, hopefully they will work out better. A little over a year ago I purchased three Hydor Evolution 600's. Every 6 months I clean them in vinegar. When cleaning them this time (third time), the sticker started to peel. I decided to remove the sticker altogether so it didn't flake into the tank. After removing the sticker, I found that there is a crack that developed from where the electric wire goes in, going outward. I was concerned and decided I'd replace it. Then I repeated removing the stickers on the other two units and found a crack in the same place. Due to the jaggedness and non-uniform direction, I am certain these are cracks and not a seem. Basically, my overall concern is that all three units cracked in the same place, and all are near the power cord. I will say that I never got shocked or anything from them, but I don't want to take that risk for myself or my fish. Very quite. Suction cup works great. BRS pricing is way better than my LFS. These pumps work really well. I have 2 850s. They run almost dead silent, turn on right away, and can move serious amounts of water. I would recommend these to anyone who doesn't want to spend a lot of money on controllable DC pumps like vortechs, but also wants very good quality from an AC pump. I love these pumps (1500gph) but was disappointed when i hooked them up to The WAVEMAKER they make clicking sounds everytime they turn on so i just run them on now. These pumps circulate water and are perfect for any tank. Ultra quiet. Does not make a sound. I purchased this power head as a replacement for my Seio that crapped out after about 6-7 years. The water displacement is broader and less direct than the Seio in my opinion, which I think is better for the overall current in a reef tank. Great product. I can't speak for use with any wavemakers or timers, but for an always-on circulation pump the combination of power, quietness, affordability and durability are hard to match. At these prices, they are attractive emergency backups as well. I use mine for a mixing powerhead, and it works great!!!! very good construction!! !